The next time you’re up for a little food adventure, we’ve got the perfect place. 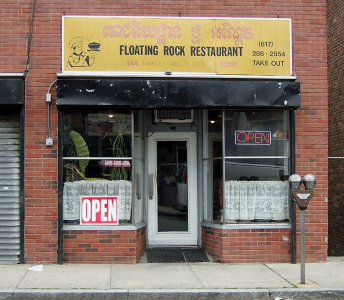 On the recommendation of folks from the Boston Chowhound board, we recently had lunch at Floating Rock in Revere, which serves Cambodian food. From the outside, it looks like a hole in the wall, but the interior is nicer than that, the service is friendly, and the food is both delicious and a bit exotic. We started with tiger’s tears, a spicy beef salad that was raved about on Chow, and we can see why. Marinated thin slices of beef, sliced red and green bell peppers, onion, basil, red pepper flakes, and lime juice—a party in your mouth. There were crunchy bits we couldn’t identify, but our server told us they were ground up roasted rice. We also tried the squid salad: tender chunks, not quite as spicy, a wonderful citrus punch, and also delicious. For main courses, we had a Cambodian pad thai, white rice, and a chicken stir fry. The latter was listed only as Spicy Chicken on the menu, but our waitress told us it was a curry stir fry and thought it was a good choice. She was right. The right amount of heat, wonderful curry flavor, tender meat, and crisp-tender bell peppers. My favorite dish of the visit. 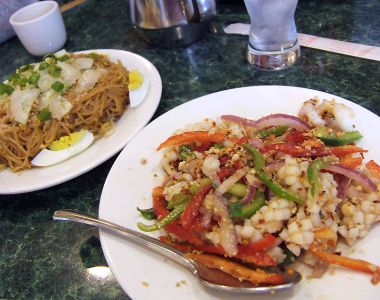 She also recommended the Cambodian pad thai, which is nothing like the traditional but has interesting flavors. The noodles were pasta rather than rice, and they were served on top of bean sprouts, surrounded by hard-boiled egg wedges, and topped with dried bonito flakes (looks like sawdust, tastes like salty shrimp). The sauce was salty and sweet at the same time, and we thoroughly enjoyed it. For those who like to cook Asian dishes at home, there is an Asian market across the street (and another next door that was closed the day we were there) with everything from 15 types of rice noodles and shrimp paste to fresh produce and strange-sounding Thai candy. Floating Rock is a few blocks from the Revere Beach stop on the Blue Line. If you commute to Boston on 1A, when you’re at the Wonderland rotary, you’re less than five minutes away. Their closing time reportedly varies though, so if you’re looking to take home dinner make sure to call ahead. If you go or have already been, please recommend your favorite dishes in the comments—we definitely plan to return.